While we do love summer squash (hello zucchini!) winter squash is at the tip of our tongues today. Perhaps it's the cold air or the sound of my neighbor trying to put their Christmas lights up way too early, no matter the cause, today is all about one winter squash in particular: the butternut squash. Also known as the butternut pumpkin or gramma, this winter squash is similar in taste to a pumpkin with a sweet and nutty flavor. Technically considered a fruit (say what?!) you can roast, saute, steam and puree this squash to make anything and everything from side dishes to breads to pasta and sauces and soups. To begin, grab yourself a medium butternut squash and peel it with a vegetable peeler. Meanwhile, preheat your oven to 400ºF and get yourself a rimmed baking sheet. You can cover the baking sheet with aluminum foil for easy clean-up, but it's not necessary. Next, cut the squash in half. This can be dangerous if you have a dull knife (another reason why a sharp knife is safer than a dull! ), so make sure to keep your fingers out of the way while you cut the squash. Once you have the two squash halves, use a spoon to scoop out the seeds. You can either roast these, save them for the growing season, or toss them. If you are using the squash in a soup recipe this would be the time to place it on the baking sheet cut side up. If not, continue to cut into 1-inch cubes. Once the squash cubes are cut, place them on the large baking sheet and toss with extra-virgin olive oil, kosher salt, and ground black pepper. You can also sprinkle in some brown sugar or maple syrup if you want super sweet squash. Cook until fork tender, about an hour and a half, but the cook time depends on how large your cubes are cut and how tender you want your squash. Remove the butternut squash from the oven and let cool. You can either serve as is or use it in your recipe. Speaking of recipes, here are a few of our favorites that use roasted butternut squash. Looking for an easy side to share on the dinner table? 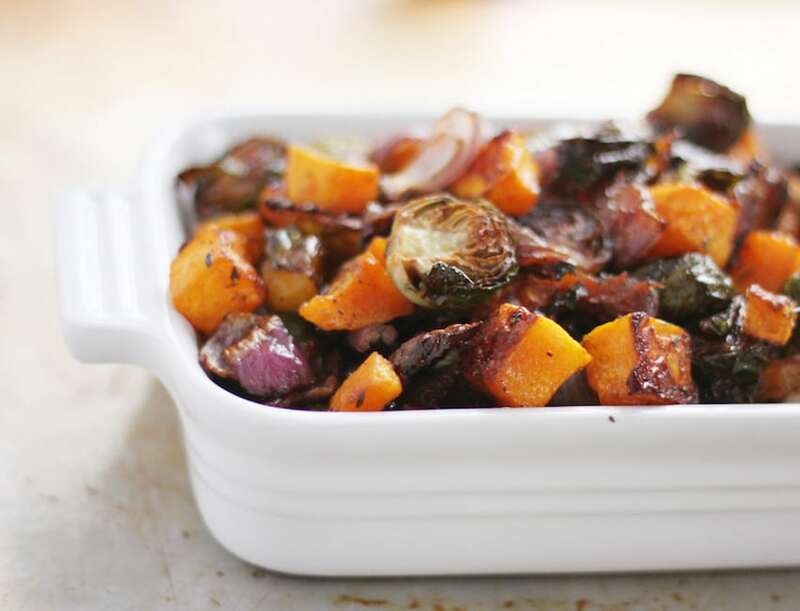 Brussels sprouts and butternut squash take center stage with a hint of maple syrup and thyme. 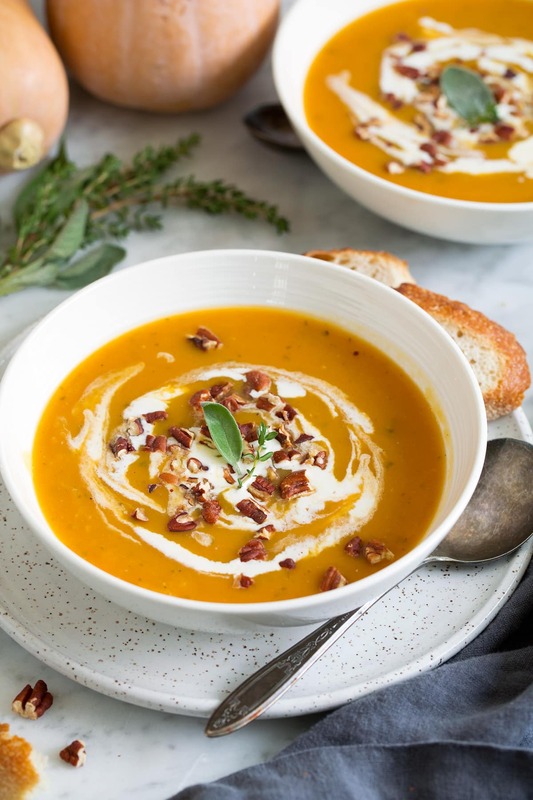 Apples, butternut squash, and onions are the stars of this creamy fall soup. This is autumn in a bowl. Tender roasted butternut squash pairs beautifully with tart pomegranate seeds, and fluffy quinoa.